Discovery Park tops the list of our favorite things about Seattle. We treasure being able to escape there for a 3-mile walk in the forest and along the bluff, hearing only the wind, sometimes not another person anywhere around. It’s hard to ​imagine Seattle without Discovery Park. 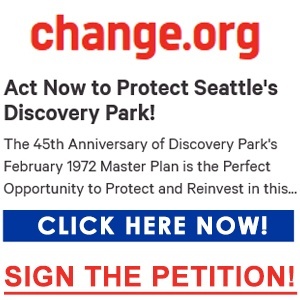 The 45th Anniversary of Discovery Park’s 1972 Master Plan is the Perfect Opportunity to Protect and Reinvest in this City Treasure! Seattle’s Discovery Park is a natural refuge for people and wildlife in a crowded city. The Park’s magnificent vistas, stretches of tidal beaches, stands of native trees and abundant meadowlands all combine to make it one of surpassing beauty and serenity, establishing Seattle as one of the great cities of the world. However, Discovery Park has been threatened by inappropriate development, deteriorating infrastructure and funding shortfalls. In fact, the Master Plan states that inappropriate special activities and structures constitute, “The greatest single threat to the park” and that they must be resisted to ensure that the Park continues to be a place of natural wonder and tranquility for future generations. Reconfirm the Park’s visionary Master Plan and central purpose as an open space where residents can experience nature and escape the turmoil of the city. Reinvest in trails, ecological restoration and environmental education programs. Ensure that future development does not threaten the integrity of Discovery Park. ​Show your support by signing the petition now! Discovery Park represents the largest city park and largest open space in a large, booming city becoming more dense by the week. There is no realistic prospect of ever adding a space of similar size inside the city should this one be whittled away by development. Although it is by no means a “pristine” wilderness, Discovery Park is dominated by undeveloped, natural space and contains several distinct ecosystem types representative of the region, from rocky tide pools to sandy beaches to moss-draped forest, to boggy wetlands, to wildflower-spangled meadow. From its highest vantage points, one can take in an unobstructed view of both local mountain ranges—the Cascades and the Olympics. “Birders” have counted more than 270 species of birds, including raptors, owls, shorebirds and seabirds. It has been (and is?) home to coyotes and even the occasional lost cougar or bear. At low tide, a mermaid’s garden of tide pool creatures appears, including sea stars, nudibranch, and anemones. Harbor seals haul out on the beach; orca whales break the surface just offshore. The park smells cool and green; it is quiet save for the birds and the wind. At dusks, bats fly and owls hoot. It is a balm for the soul and a joy for Seattle residents. Many generations of Seattle children have forged their first connection with nature there—seeing a garter snake slip into the tall grass, building a temporary fort of driftwood, or wrinkling small noses at the pungent smell of skunk cabbage. The park is especially important for lower income Seattle residents, who may not be able to easily access the large natural areas outside the city due to the expense and the need for a car. All you need to transport yourself to the park’s green and peaceful landscape is to hop the #33 bus from downtown.